Back Protector is made of multilayer foam does not use plastic plates. The Back Comfort is CE EN1621 level 2 and is particularly suitable for use off-road and snowboarding. 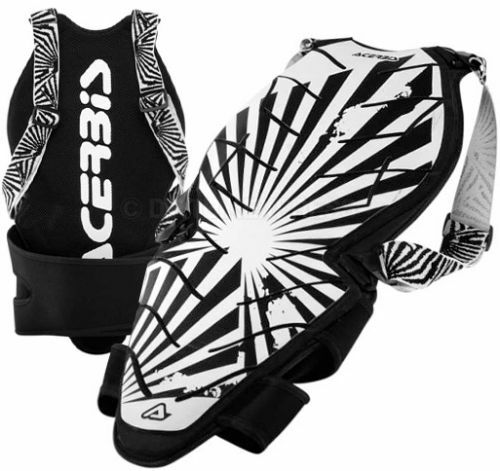 Adjustable and removable shoulder straps, elastic waistband made ​​of neoprene with Velcro closure. Spine protectors have the function of limiting the transmitted forces in the case of a fall or an impact against an obstacle. They have a certain amount of flexibility in the arched direction of the protective segments; however, it is important to note that excessive flexing or twisting of the spine protector could cause a loss of the protective capacity of the product, or possibly even breakage. It is suggested that, after any type of traumatic impact, the structural integrity of the spine protector should be checked. The spine protector does not protect against torsion trauma or against extreme movements. The PROGRIP Spine Protector has passed all the necessary requirements of the European Directive 89/686/CEE (and successive modifications) and has passed the Technical Regulations EN1621/2. This product was certified by the Authorized Organization of the EEC. It is limited to the transmitted forces in the case of a fall or an impact against an obstacle. The spine protector is flexible in the direction of the curved elements forward and backward, because excessive rigidity could generate the transmission of the forces outside of the protected areas and, in particular, onto the neck. 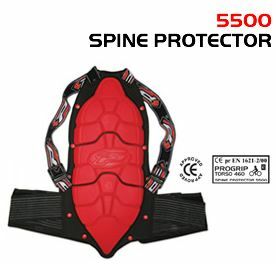 The spine protector does not protect against risks of external torsion or movement. CE: The CE label that is applied on every single PROGRIP spine protector is proof of the conformity to all of the required features that are obligations of the manufacture with relation to the product, to the sense of the existing laws and regulations. The CE label attests, moreover, that whoever has labeled this product verifies that it conforms to ALL THE EUROPEAN COMMUNITY REQUIREMENTS that are applicable to spine protectors and that the PROGRIP spine protectors have undergone EEC Certification.